Prajñādhara is a division of Snehadhara Foundation that looks at learning and practice for all. 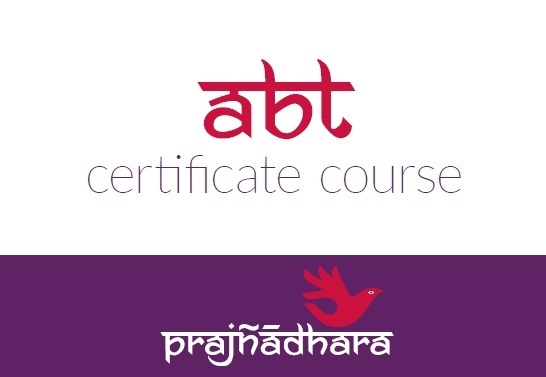 The twin goals of Prajñādhara are the Arts Based Therapy (ABT) Certification Course and the Study of the Mind series. 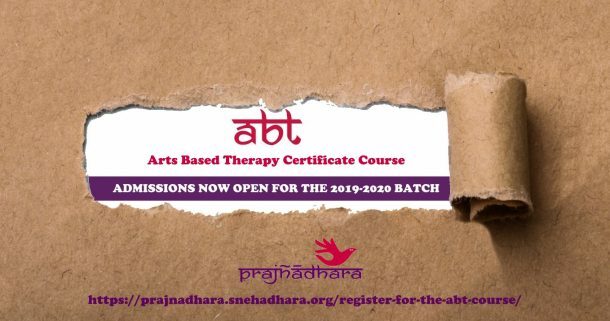 Arts Based Therapy (ABT) certificate course is a nine-month part time course for therapists, social workers, caregivers, educators, special educators, clinical psychologists, psychiatrists, physiotherapists professionals, and doctors. The dynamic combination of traditional and modern artistic material, with an interdisciplinary basis of Indian Psychology, Philosophy and Modern Science makes ABT a viable and meaningful therapeutic practice. 1. Teachings from Masters in the field of Indian Mind Traditions. 2. Pradnya Smriti , an 8 session program on ‘Wisdom based Mindfulness’. Prajñādhara is a division of Snehadhara Foundation (SF) , a registered non-profit organization based in Bangalore. SF is the only organisation in the country that works using Arts Based Therapy as a primary methodology in working with children and adults with disabilities. The ambit of Snehadhara’s mission encompasses working with children across disabilities and across age groups using the Arts (Direct Care); co-creation of empathetic learning spaces in schools, colleges, corporates and the community (impART); as well as certification for Arts Based Therapy to construct a facilitation model for learning and inclusion (Prajnadhara). Prajñā means wisdom and translates into realizing or perceiving the true nature of reality; seeing things as they are, not as they appear. The twin goals of Prajñādhara are Arts Based Therapy (ABT) Certification and Study of the Mind. The two pillars for developing secular ethics are: to embrace our common humanity, including everyone’s desire to avoid suffering and to be happy; and, to understand the importance of interdependence with others. The value to individuals and society as a whole cannot be underestimated. It is through such values that we gain a sense of connection with others, and it is by moving beyond narrow self-interest that we find meaning, purpose, and satisfaction in life. Snehadhara Foundation is the only organisation in the country that uses Arts Based Therapy as the primary methodology for working with children and adults with disabilities. The basis of this course lies in Indian Psychology and Ethics, Studies of Human Development and Cognitive Neurosciences. The course uses WCCL Foundation’s textbooks. Course trainers, Gitanjali Sarangan and Sumathi Ramjee are trained as ABT Educators with WCCL Foundation, Pune. They have the competency to teach ABT after an intensive two years of ABT Educators’ Programme of WCCL Foundation. The ABT educators of the course are recipients of the Millennium Alliance Grant and have trained educators, therapists and psychologists and educators in organizations across the country. Supervisors to the course are all accredited teachers of ABT or senior registered ABT practitioners.